Last week we explored how scientists at the University of Manchester use their science labs, and how they compare to the artist studio. 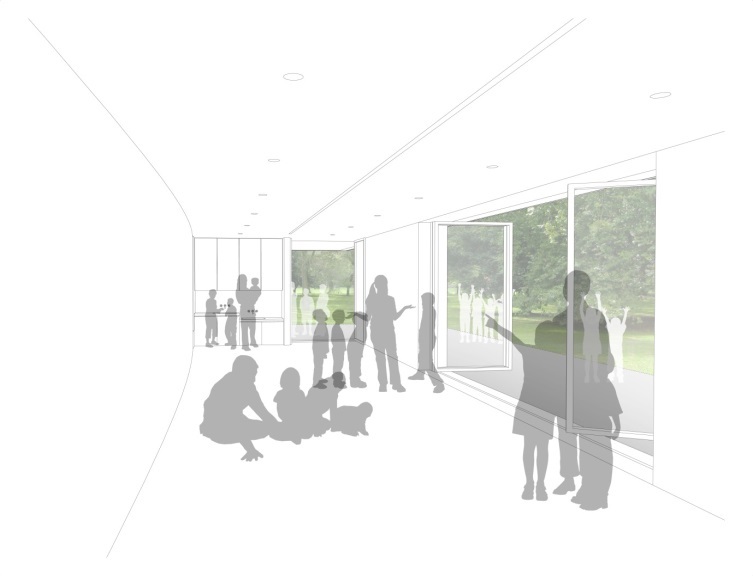 This week we will be looking at the ways in which learning can take place within the laboratory, and how this can help us as we prepare to move into the Clore Learning Studio in autumn. 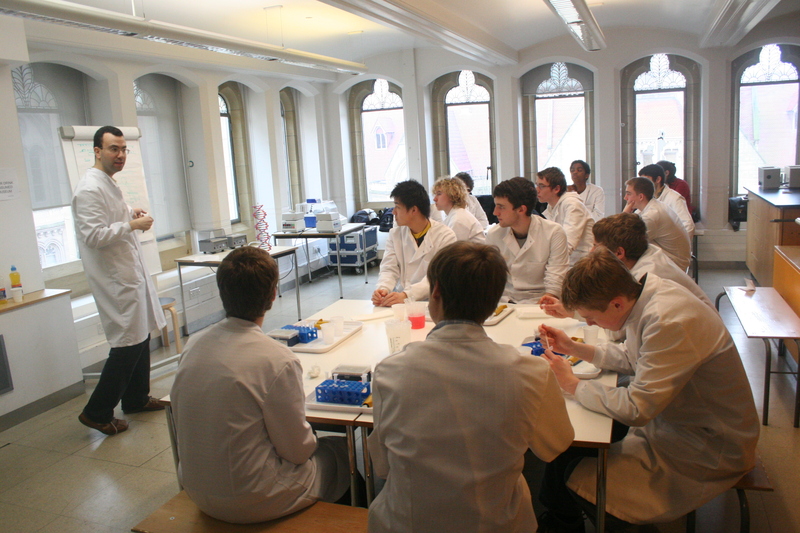 Manchester Museum, The Whitworth’s partner institution, has its own laboratory space within the Museum that is used for learning sessions with high school and sixth form students. The Science programme is delivered by a team of PhD student demonstrators who are all current researchers at the University of Manchester. This means that pupils get an opportunity to work in an authentic environment with real scientists. Emily Robinson, the Lab’s coordinator, says that the PhD students are there to facilitate experiments, not to teach classes. Emily states that this allows those taking part to gain a different experience than they would in the classroom at school, as they gain practical experience of working in a laboratory and conducting experiments themselves. The sessions undertaken by pupils in the Museum’s laboratory are also supported by specimens from the Museum’s collection, and have a link to current scientific debates. This encourages pupils to think about the real world applications and ethical considerations of their experiments, as though they were professional scientists. 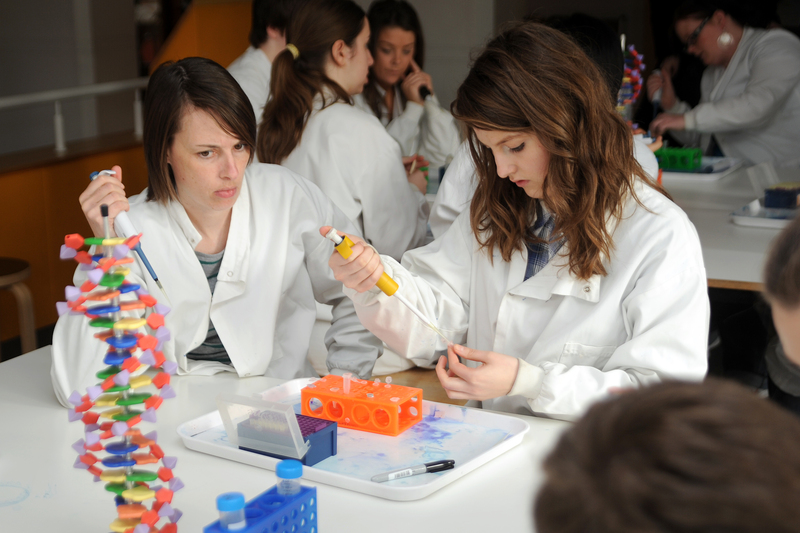 The Science programme at the Manchester Museum offers a hands-on, exploratory approach to learning, allowing young people to engage with scientific research in a unique and exciting way. The learning team at the Whitworth hope to create a similar atmosphere in the Clore Learning Studio. Our aim is to create an environment that allows learners to develop their own ideas about art, and express themselves with creative freedom. As practical spaces both the science lab and the art studio offer opportunities for experimental learning based on authentic experience and personal development. By observing how our colleagues at Manchester Museum use laboratories as environments for learning, we are able to identify similar possibilities within the artist studio at the Whitworth. As we get closer to moving into the new Clore learning studio , the learning team have been looking to a variety of sources for inspiration. At the Whitworth we are really proud of our link to the Manchester Museum and the University of Manchester, so we decided to look at the environments in which our colleagues at these institutions work creatively. Interestingly, we found that creative thinking was an important part of working within the science community, and as a result there are many similarities between artist studios and science labs. This week we have spoken to Professor Anthony Freemont, head of the undergraduate medical school and a professor of Osteoarticular Pathology at the University of Manchester, about his experiences of working in a lab. Professor Freemont is in charge of a number of science labs, and manages a team of technicians and researchers who work in them day to day. He describes the processes of working in a lab as being very collaborative, with every part of a project being completed in partnership with others, whether they are fellow professors, PhD students or technicians. This arrangement seems quite different from some of the contemporary studios that we have looked at so far, where artists work on their projects independently, and their studio is a private space. However, if we look further back in history we can see that many artists managed large workshops, instructing teams of staff, who were often training to be artists themselves, to produce the work that they have designed. This practice has continued into the present day, with well known international artists such as Takashi Murakami, and Jeff Koons employing teams of assistants to complete projects for them. Baring this in mind we can begin to see how the organisation of laboratory work is mirrored in the structure of artist studios where collaborative processes are used. Professor Freemont says that the science lab is a place of production rather than creative inspiration, where the practical experiments that researchers have developed are put into action. In this way, he believes that there is a difference between science labs and artists studios, as he describes the experimentation process as very rigid and formal compared to the responsive possibilities of working in a studio. He states that working in a lab is a linear process; once a researcher has designed an experiment it is put into practice and carefully controlled, with the results being analysed at the end. This is in contrast to the work of an artist in their studio, who is able to react and change the course of their project at any point. It seems that whilst both science labs and studios encourage creative thinking, they do so in different ways. In the laboratory creativity is employed at specific points in a project, whereas the studio allows creativity to be constantly acted upon. However, there are similarities in the ways that artists and scientists work collaboratively in their spaces, managing teams to execute their creative ideas. Next week we will be looking at how science laboratories can be used to encourage creative learning at the Manchester Museum.